The durable Pro-S Series Spray is constructed of high-impact ABS plastic for long life in the harshest conditions. The outstanding performance is the result of precision engineering, bringing us a co-molded wiper seal for leak-proof operation; full pop up operation, even in low pressure situations, with heavy duty retraction spring; and the rugged body and cap design. 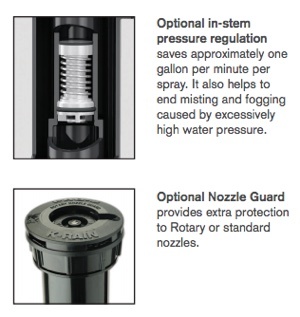 The Pro-S Spray is designed to be compatible with all standard female threaded nozzles. All are male threads risers with a flush cap included. Spray nozzles sold separately. The 6" models have both the bottom and side inlets for convenience of various installations. Unit is a direct replacement for Rainbird 1800 series sprays. 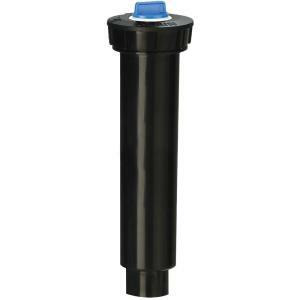 The Pro-S Riser assembly drops right in an existing RainBird 1800 series can! 4" Pop-up w/nozzle guard - 6-1/4"
6" w/nozzle guard - 9-5/8"